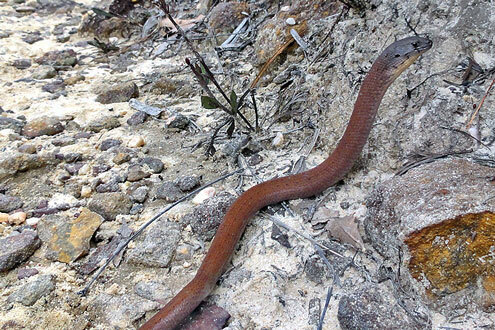 One day in June I was halfway up the summit track of Mount Banks in the Blue Mountains when I came across a Common Scaly-foot (Pygopus lepidopodus), a legless lizard, right in the middle of the track itself. I don’t know who was more surprised, it or me! One part of my surprise was its size, about 700 mm long. The creature was not torpid, but equally, was not afraid, so I was able to snap a couple of photos. At the time I was at about 940 m altitude, pretty well at the top of the second flight of steps before entering the Open Forest to the summit, in terrain that was windswept, short Sydney Montane Heath, and very rocky. The temperature that day was about 9°C., which I thought was a bit low for such a creature to be abroad. The length of the body, snout to vent (SVL), I estimate is about 300 mm. In the photograph there is a slight change in form and colour (arrowed) at the end of the body and the beginning of the tail. This is where the Scaly-foot has one of its distinguishing features, two scales that are all that is left of its former hind legs – evolution can be strange! Its front legs have entirely disappeared. I also noticed that the final 100 mm of its tail was a different colour and texture to the rest of the tail and its body, and I wondered if that portion was regrowth after having lost part of its tail. If so, this Scaly-foot may originally have been an impressive 750 mm or more. Wikipedia claims that they grow to 800 mm. The Scaly-foot is often mistaken for a snake (and consequently often killed) but it is actually quite different and not venomous. The two scales at the vent are major features, but then so are the presence of ears just behind the eyes (snakes don’t have ears! 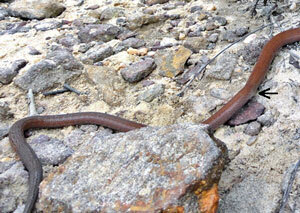 ), and a very long tail in proportion to its body (2–3 times), whereas a snake has a short tail. The Scaly-foot has a broad fleshy tongue, not like a snake’s narrow forked tongue; and the Scaly-foot also has no eyelids, so its tongue comes out sideways to lick the eyes clean. 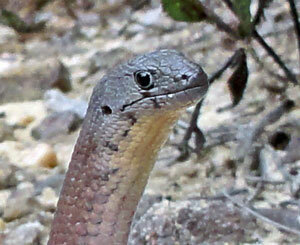 There is also a black line down from the eye towards its jaw. It is variable in colours and pattern, occasionally grey with black spots, or more often coppery brown with a grey head and tail. Its diet includes a variety of invertebrates such as crickets and burrowing spiders. The female usually lays two eggs per clutch. 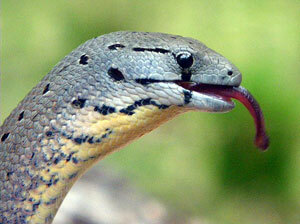 When threatened, the Scaly-foot flashes its thick, fleshy tongue, in apparent mimicry of snakes. The name Pygopus means 'rump foot', referring to the flap-like scales either side of the vent: lepidopodus means 'scaly-footed'. There are five recognised species of Scaly–foot, widespread in Australia, and they are part of a large family that includes 12 Worm-lizards, 21 Delmas, Burton’s Snake-lizard, the Bronzeback, the Brigalow Scaly-foot and the Keeled Legless Lizard. The Common Scaly-foot occupies the southern portion of the Australian continent. Cogger, Harold (Hal) George, 2014. Reptiles and Amphibians of Australia, Seventh Edition. CSIRO Publishing, Melbourne. ISBN 9780643100350. Reed New Holland, Sydney. ISBN 1 877069 30 2. Three Sisters Productions Pty Ltd, New South Wales. ISBN 0 9590203 3 0.